﻿﻿Everyday commuting to reach the office, I ride the dreaded MRT. Metro Rail Transit line 3. The congested coaches, the faulty airconditioning and most of all, the people you see everyday. A menagerie of rare social animals. The types of people you see here are somewhat the reflection of what types of people living in the metro are. I usually ride from Boni station and then alight at Magallanes station. 5 stations all in all including Boni and Magallanes. In between those 5 stations, you might get a birds eyeview of what filipinos are. This post might be biased though as I always ride with the ladies, handicaps, pregnant women and senior citizens when I am alone - and that is usually the case every morining. These are usually the first ones you will see upon reaching the platform of the train station. They will block the door of the train once it reaches a full stop oblivious to the markings in the floor indicating that you need to first let the passengers alight the train before boarding. This is simple logic. why cant some people get this? block the door and the people alighting the train cant go out. If they cant go out, there will be no space for new passengers, if there is no space, they simply cannot go in the damn train. Wouldnt be life more easier if they just let passengers get down first before riding? Sometimes I just want to get the attention of these people and indicate the markings on the floor. Maybe they just cant see the sign. Worst case, maybe they just dont care. These types are also usually the ones who just got in the platform, see a line infront of the door but still try to squeeze themselves in wherever nook they found just to ride the MRT. Maybe they are running a bit late? but what about the other passengers who got there before them? dont they have any shame left in their system? As I said, I usually ride the first coach of the train for seniors, women, preggys and handicaps. Sometimes you will see these healthy, young and able bodied females sit in the seats in the train while all the while there is a senior citizen at their side who is having a difficulty standing up when the train is at full stop let alone when the train started to move. insensitive much? Pregnant women and handicaps (especially the lame) are not spared from the wrath of these types. The type of people that are most likely subscribed to unlicall. They will make phonecalls while inside the train and talk with voices louder than what is deemed to be normal speaking voice. They will laugh, shout or do whatever reaction they make due to statements made from the other end of the line. People will sometimes stare at these types but they are oblivious to this fact as they are more concerned at the conversation between them and the person on the other end. I cant help but overhear some conversations between these people and most of the topic are about showbiz, the life story of their sisters' neighbors' husbands' brother or whoever relative, friend, or neighbor's life they deem to be interesting. In short, garbage information. My encounter with this type is one that I will not forget easily. The worst case I experienced (more likely watch because it didnt happen to me) with this type is between this girl (maybe in her teenage years) and an elderly old man maybe around 60-70. The girl alight in the train first. probably went in at the same station that I came from. She stayed near the door with her back on the door in the driver's pod. I stayed near the middle as the train wasnt that packed. I think its a weekend. Not sure. Then upon reaching the next station, an old man went in and went infront of the girl, facing her, both his arms raised a little above her head. (The horror. @. @ I cant imagine what I would do if that was me. ) As I said, the train wasnt packed. There are still some seats available so it was kinda weird why he positioned himself like that. As I was observing them, the girl was somewhat sending this mutinous, deathly glare in the direction of the old man but I dont think the old man care. I personally think he was enjoying himself. WHY?!?! I got down the station first so I didnt know what else happened but if that was me, I wouldve moved to another place. That position is soooo uncomfortable. Imagine the telebabad-kung-telebabad-wapakels-sa-makarinig times two. Double jeopardy. In this case, you hear both sides, not just one. The rare type of kala-mo-ang-tagal-hindi-nagkita-kung-magkwentuhan. Their conversation has taglish version. These are some of the people you will most likely encounter in riding in the first coach of the MRT. I dont know about the rest of the coaches. I heard they have it worse there. Sadly, my current project will move to a different location. The new location does not require me to ride the MRT. 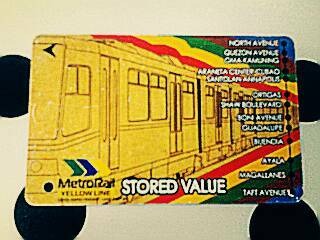 Riding the MRT will surely be missed. The people, experience, headaches and all. Parting with you is such sweet sorrow. I look forward to the day that I will be ridding you again - or NOT!